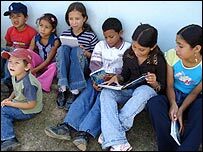 A university in Venezuela is using a novel method to take books into remote communities and encourage people to read. As James Ingham reports, the scheme is proving a great success. Chiquito and Cenizo greet me with a bit of a snort and a flick of the tail. Mules are too tough to bother being sweet. They do a hard job which no other animal or human invention can do as well. But these mules are rather special. They are known as bibliomulas (book mules) and they are helping to spread the benefits of reading to people who are isolated from much of the world around them. My trek started from the Valley of Momboy in Trujillo, one of Venezuela's three Andean states. These are the foothills of the Andes but they are high enough, especially when you are walking. The idea of loading mules with books and taking them into the mountain villages was started by the University of Momboy, a small institution that prides itself on its community-based initiatives and on doing far more than universities in Venezuela are required to do by law. Accompanying us was local guide Ruan who knows a thing or two about mules. He was their boss, cajoling them carefully as they started up the hill at a slow-but-steady, no-nonsense plod. The deeply rutted, dry and dusty path snaked its way up. The sun beat on the back of my neck. We were all breathless, apart from Ruan. A break came when it was my turn to ride a mule. I enjoyed a great view of the valley but held on tight as Chiquito veered close to the edge. Hot and slightly bothered after two hours, we reached Calembe, the first village on this path. Anyone who was not out working the fields - tending the celery that is the main crop here - was waiting for our arrival. The 23 children at the little school were very excited. "Bibilomu-u-u-u-las," they shouted as the bags of books were unstrapped. They dived in eagerly, keen to grab the best titles and within minutes were being read to by Christina and Juana, two of the project leaders. "Spreading the joy of reading is our main aim," Christina Vieras told me. "But it's more than that. We're helping educate people about other important things like the environment. All the children are planting trees. Anything to improve the quality of life and connect these communities." As the project grows, it is using the latest technology. "The farmers can reply telling them how much they can produce. It's blending localisation and globalisation." The book mule team played noisy games with the children, listened to them read and lunched with the adults, discussing over a hearty soup and corn bread how the community can develop the scheme. One idea was using the mules to transport medicines which can be so hard to get hold of here. Everyone I spoke to - both adults and children - was full of enthusiasm. "It's great," said 12-year-old Jose Castillo. "I love reading books and we get told some really nice stories." Looking up from reading her book about Harry the cat and his trip to the vet, Gesenae Guerdo told me she loved reading too. "We share a lot of these books," she said. "The children are really motivated to read and we are too. A lot of the adults are reading more. It's great that they come up here." The university has acquired a new mule. They are going to keep it in Calembe under the care of the locals, something Javier really approved of. The mule will be able to get further into the mountains and spread the word to more villages that so far remain too remote. With fond farewells we left Calembe behind. It was clear I was leaving a place with a strong sense of community. This four-legged mobile library is not just keeping this place alive but making it thrive. From Our Own Correspondent was broadcast on Saturday, 4 August, 2007 at 1130 BST on BBC Radio 4. Please check the programme schedules for World Service transmission times.